Image caption Emmerson Mnangagwa said elections were "nearer than you expect"
Zimbabwe's new President Emmerson Mnangagwa is seeking the removal of sanctions imposed by Western countries, saying they are crippling national development. Is Mnangagwa any different to Mugabe? 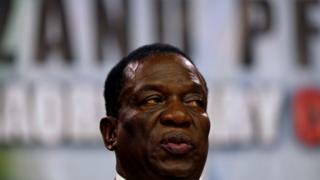 "We call for the unconditional lifting of the political and economic sanctions, which have crippled our national development," Mr Mnangagwa told party leaders in central Harare. "We realise that isolation is not splendid or viable as there is more to gain through solidarity; mutually beneficial partnerships." The president also said that elections were "nearer than you expect".